My kids love Richard Scarry's Chipmunk's ABCs book, and the Duchess is deeply fascinated by the letter M, which features a drawing of Chipmunk's friend Mouse, who has mumps. "Why does he have a cloth around his head," she constantly wonders. That's to keep an ice pack on his swollen glands, kiddo, I tell her, because mumps were really unpleasant. I'm glad she won't be getting mumps - or any other disease that is prevented by vaccines, because she's getting all her vaccines on time. Even the most mellow of parents will get exercised over something child-related, and the bee in my bonnet is vaccination and people who don't or won't do it. Although there is a miniscule risk that a child will have a terrible reaction to a vaccine, there is a very real risk that an unvaccinated child will catch one of those diseases if a lot of other people haven't vaccinated for the same reason. This fear, and other fears caused by the discredited notion that vaccines cause autism, have caused a measles epidemic in Wales. So I've decided to tell you my story. When I was four, I got very sick. I remember being in my bedroom having trouble breathing, and my parents rushing me to the hospital. (I also remember throwing up on my mother as we pulled in, car seats not yet being standard back in 1976). It's a little blurry after that - the doctor calling me "princess," and telling me that I would be okay. And then two weeks in recovery under a croup tent in the hospital, during which my mom gave me orange sherbert for a treat (resulting in my total aversion to artificial orange flavoring, a side effect of my hospitalization that I'll gladly accept). I had something called epiglottitis, which was a nasty infection that causes the epiglottis to swell up and prevent breathing. (Fun fact that I just learned today as I was looking this up on WebMD: George Washington died of epiglottitis). Epiglottitis was so dangerous and life-threatening that emergency rooms used to run drills so they would be prepared when children came in presenting it. I was fortunate that the ER to which my parents took me had recently practiced what to do so they were able to swing into action upon my arrival. 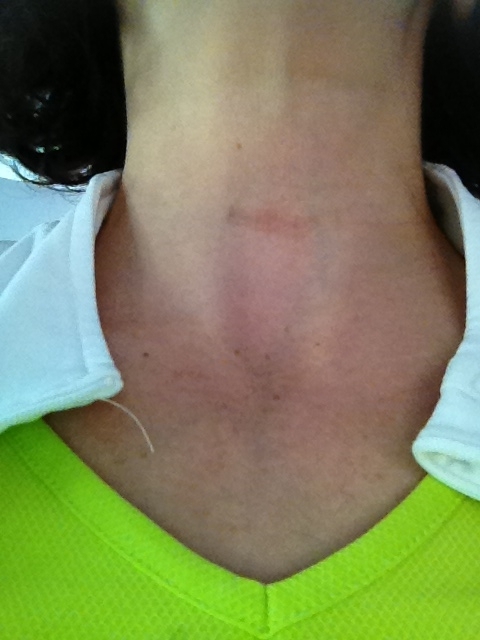 This is a photo of my scar - a relic of the tracheotomy that Dr. B did that saved my life. You usually can't see it because he had the presence of mind to put it in the fold of my neck, but it is there. Nowadays, nobody gets epiglottitis anymore because of the Hib vaccine, a standard vaccine that I made sure my kids got as soon as possible. Periodically I have cause to discuss my scar with various doctors along the way and it is interesting to note their astonishment. My friend, a pediatrician, was deeply fascinated, since she had only heard about epiglottitis in medical school, as one might learn about the Black Plague. Recently, while at the ENT with Honey, we randomly got on the topic of tracheotomies and the doctor marveled at my scar. He said it's the kind of disease that his mentors told him about but that he had never seen more than one or two cases of in his entire career. So the next time someone tells you about the cousin's coworker's neighbor's kid who supposedly got autism from a vaccine, don't just remember that endless resources have been spent to show that vaccines don't cause autism. Remember the very real diseases that vaccines prevent and the catastrophic results that can happen if kids are left unprotected.